Content marketing is where business owners were most likely to report an increase in spending over the last 12 months (56%). Increased spending on content marketing staff became the distant second (37%), followed closely by paid content distribution (36%). They also got to know that 37% of brands are planning to up their 2019 content marketing expenses. It tells us that small businesses will keep investing hard in content marketing and content production will keep skyrocketing in the future. The ideal blog post length of today is 1,600 words. Plus, 60% of marketers create at least one piece of content each day. Even after that, most contents on the Internet don’t get the eyeballs. Ahrefs reports that 91% of content receives no organic Google traffic. Instead, focus on creating a bombproof strategy for content distribution. Because, let’s be honest: the secret to a successful content marketing strategy is distribution. With an effective distribution strategy in place, you’ll ensure traffic for your every published piece. Repeat that distribution and you will ensure the eyeballs of who missed it the first time. Sadly, many marketers fail to embrace content promotion and miss out on a massive ROI chunk. In fact, Aaron Orendorff, Forbes’ 10 Best B2B marketers, spends 25% of his time promoting his content. Long story short, in 2018, you need to take content distribution seriously for seeing content marketing success. So today, we will look at 9 content promotion tactics that you can use. Social media tycoon Gary Vaynerchuk extracts tons of value from each piece of his content produced. First, he publishes an extensive “pillar content” on YouTube. Then, he makes several pieces of “micro-content” from each episode. Then, he passes them onto his 16-person team to update his social media feeds. And he highly encourages us to do that as well. Converting blog posts into newsletters. Converting your content into slides at Slideshare. Turning statistics into Tweets as these get retweeted a lot. Transforming blog posts into podcasts through someone on fiverr. Converting your blog posts into videos by using tools like Lumen5. Re-publishing your articles with some edits at LinkedIn, Medium and Quora. Repurposing your content into Kindle eBooks to land some email subscribers. Another more personalized tactic is showing up on camera, like Aaron Orendorff. At times, he uses video promos like this to announce the publishing of his epic content pieces. You and I both know how valuable newsletters are in business. According to statistics, email is 40x more effective for getting new customers compared to Facebook and Twitter combined. Emails are also the highest ROI-generating channel for marketers — for every $1 spent, email marketing gives you $44 in return. So after someone has read your content and grown interest in your brand, go ahead and email them your latest updates. 91% of US adults like receiving promotional emails from businesses they work with. And unlike social networks, email marketing doesn’t require you to stay updated with the algorithm changes for reaching your audience. 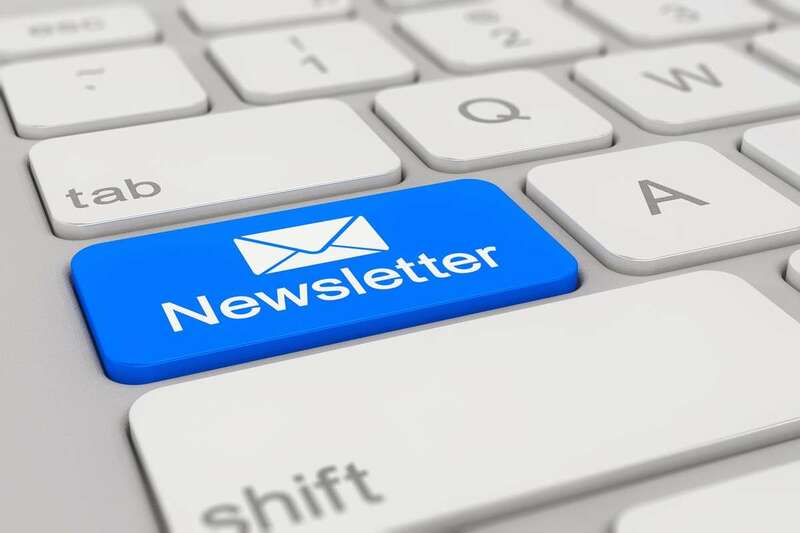 In fact, creating a newsletter program with a broad audience can generate traffic and social shares to your content while triggering a snowball effect. When you email a newsletter, you get traffic. And if you have some share buttons in place, some of that traffic gives birth to social shares. These social shares result in more traffic, which results in more social shares. Which results in more traffic, and so on. However, simply asking for email submission no longer offers the results like before. So it’s imperative that you start building your list by offering a precious lead magnet. And if you’re still confused about selecting your email marketing service, start with MailChimp as it gives youo a forever free plan that allows you to send 12,000 emails to up to 2,000 subscribers. After that, their paid packages start at $10/month. 90% of all marketers say that social media marketing has increased their business exposure. 66% of marketers that spend at least 6 hours on social per week have seen more leads. So, once you’ve emailed your article to the subscribers, you should shoot the links to your audience on social networks as well. Doing so will land you more targeted traffic, ramp up your SEO and help you cultivate a relationship with your audience. Buffer is a solid social network management tool that helps you plan your updates throughout several social networks, making your social strategy less of a time-sink. Buffer also suggests the perfect times to post based on follower activity. Buffer’s ability to spot out your top-performing posts is a great touch for those trying to improve their social content in the future. Most social media posts reach a small number of followers. So, it’s not enough to share your content just once. To get the most exposure, you have to repeat your posts. It can be as simple as retweeting your top tweets. It can net you 90% extra clicks on your links. Even though there are other plans for big-name companies, the free version just may be enough for you. Its free plan lets you manage 3 social profiles, schedule up to 10 updates, use their mobile apps (iOS and android) and browser extension and produce and schedule content using their image creator and video/GIF uploader. Unfortunately, if you want to shorten links and track them alongside the RSS Feed feature, you’ll need to opt for a paid plan, which ranges from $10 to $399 monthly. Also, use this social media scheduling template from HubSpot: it works for Facebook, Twitter and LinkedIn. Lastly, even though scheduling is excellent for social media productivity, making manual shares is still important. Because nothing beats the process of sharing natural and emotional hot updates, breaking news or your current mood status. If you’re looking for a new marketing community, Reddit is your go-to. Reddit attracts about 164 million unique visitors every month (huge number, eh?). Plus, Redditors are amongst the savviest communities on the internet. If they suspect you’re there to promote own content, or don’t follow their reddiquette, you may run into bad consequences. Remember… Reddit is centered around user-generated content that can be upvoted or downvoted by the users. Posts that receive tons of upvotes make it to the Hot page. This applies for subreddit pages as well as main Reddit page. Imagine what you will accomplish if your post reached the front page. We’re talking about avalanches of traffic, followers and some sales too. However, don’t get carried away. You can’t simply share a link & have thousands of people flocking to your site. On the contrary, that will get you banned. So, what is the #1 way of promoting your content on Reddit? The answer? Not ‘trying to’ promote your pieces. Rather, focus on being a true Redditor, and offer value to your communities by striking up conversations. Keep your Reddit posts super relevant. Tailor out posts for the subreddit you’re posting in and avoid content that’s for too broad of an audience. Do some research and figure out the sort of posts that are already popular in those subreddits. Also, make sure to share your best of the best content only on reddit. Short and generic content get down-voted and make you lose reputation points (karma). Only submit in-depth, well-written, unique, actionable and helpful content. Remember that the quality of your content will determine whether the users upvote or downvote. Once you’ve submitted a link in a subreddit, let it rest for some time. 2-3 weeks seems like a good spot. Don’t over-promote because the group mods and spam filters may ram you over. Long story short – don’t be a Reddit marketer – use Reddit like a true Redditor. Once you’ve created a cornerstone content, the next step is to promote the heck out of it. Guest posts are an excellent way to just that. You can simply drop your link in the body of the article and witness the spike in your traffic. However, the majority of the sites only allow author bio links for your brand exposure. In such cases, repurpose your content as a lead magnet in exchange for emails on a landing page. You can also make an infographic and custom images for your guest article to enhance the reading experience. You can also link back to your site as the credit for the infographic. However, if you’ve been guest posting for some time but haven’t seen your traffic increase, you may want to reconsider the sites you’re posting on. After your article is published, politely ask the webmaster to share it on their social media pages. You can also request them to email it to their subscribers. A great way to get your request accepted is by offering to share the post on your social channels too. This benefits everyone. Their site receives more traffic, therefore, more people see your guest post, which increases the chances of you getting more traffic to your own site. So, don’t just sit there waiting for people to hit you up about writing guest posts for their websites. That may never happen unless you’ve got a big-name site, reputation, name and brand. Rather, be proactive and always look for new guest blogging opportunities. Grow long-term relationships with as many people as you can to help you get more exposure. Growing your followers is no a cakewalk. Without a budget in place, getting followers on networks like Facebook and Twitter will prove to be a long haul. Some tactics do well, such as, adding social sharing buttons on your site. However, even though people may share your content to their profiles, they won’t necessarily add or follow you to their network. Ever seen blog posts with a “click to tweet” link that lets readers tweet just that quote and not the entire article? This is a great little method for getting more tweets and traffic to your blog every day. If you select concise, exciting, profound thoughtful excerpts or quotes, you can have a massive impact. Brian Dean has used this successfully for his Backlinko blog. Another great way to earn more social exposure is by locking your top content and making your readers follow you first so they can open and read it. Remember that this content must be unique and helpful to your readers — something that they may even pay for. Tim Ferriss uses this in a few of his prominent blog posts in exchange for emails from his readers. A WP plugin called OnePress Social Locker can do the job for you. As a newcomer, getting your voice heard amongst the big marketers can be hard. At times, all the hard work and time spent crafting quality content may seem to yield no result. So how do you overcome such an emptiness? How can you finally make it to the top marketing pros and hang out with the sharks? Your best bet is to ride the coattails of those influencers – aka influencer marketing. When crafting content, it’s an excellent idea to include experts on the piece. You can email and request quotes, personal, and expertise for adding authority to your content. If the content you create is top-notch, then influencers you involved will happily share it. Even if you don’t get a quote from the influencers, you can still get in touch if you referred to their advice and let them know about the mention. Simply email them using the contact forms on their sites. Would you mind sharing the piece with your social media followers? They’ll love all the value I’ve added there. It would also be a pleasure if you could come and drop your thoughts on the post. Whether the influencer will share your article depends on your industry, the influencer and the quality of your content. However, before you ask directly, always make sure to offer value to their audience. Sharing their pieces, dropping comments on their site, thanking them with emails beforehand are a few examples. 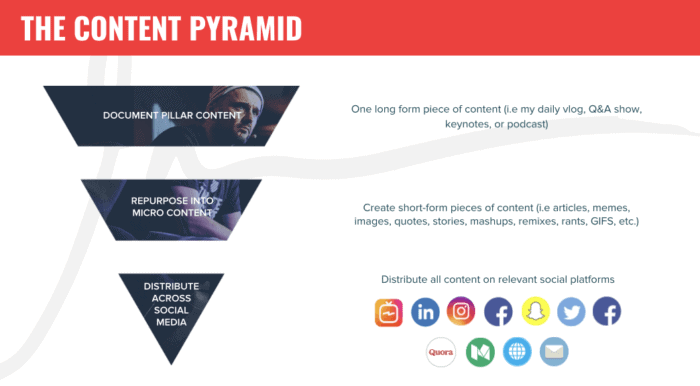 And if you’re really interested in this tactic, here’s a gem equivalent of resource for you: contentmarketer.io. This site can help you get the contact info for anyone you’ve mentioned. Video marketing is anticipated to generate more than 80% of the entire internet traffic by 2019. 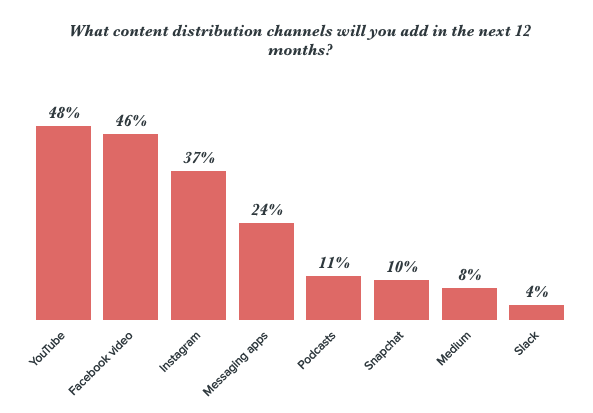 And according to HubSpot, about 50% of marketers will leverage YouTube & Facebook channels for video dissemination in 2019. So go ahead and select your content (a blog post, for example), and record yourself explaining the subject in detail. Or you can also hire someone to explain or create an animated video covering the topic. Then share it on your blog and on YouTube, Blip.tv, Vimeo, and other online video communities where there’s a massive demand for quality videos. The service OneLoad makes it possible to upload your video to various video sites at once. All you have to do is upload your content on OneLoad and they’ll do the uploading for you on all major content sharing sites. Such content syndication comes with a ton of benefits. And the best of them all, your content delivery costs are covered by the sites being uploaded to. While it’s a great idea to convert written pieces into a videos, don’t forget that focusing solely on video content is a lot more effective. Think about it — you can use the audio of that piece and create a podcast out of it. And with some edits to the transcript, that can also serve as a great piece of blog post. And as people now love videos more than ever, you can land a lot of clicks despite being 3rd or 4th on the Google because images (the thumbnails) appearing in searches attract a lot more clicks than plain text. Lastly, let’s talk about paid promotions. Even though some content creators aren’t up for paid exposure, with the explosion in content production, the comparatively cheap social media ads are a solid way to get social traffic. In fact, it’s the fastest way to get your content in front of qualified customers. On Facebook, you can start simply by targeting similar brand audiences. However, for getting the most bang out of your buck, split tests on ads do wonders. Quuu is another excellent paid promotion platform. But how does it work? Basically, it posts content to your social media accounts, making content promotion easier for you. All you have to do is add your content into Quuu, and the tool will share it with your target audience. Thus, it helps you earn organic shares and mentions. In fact, it is an excellent way to eliminate the need for advertising your content on Facebook and Twitter. Rather than boosting your post, you can spend a few bucks for hundreds of organic, real, active users to share your content to a targeted audience. Social media power users wanting to post updates for engaging their audience. Content creators wanting to get exposure. My tweet impressions went up 169.4%, mentions 218%, retweets and likes 167%, and link clicks 467.5%. Aside from the mentioned ones, Outbrain and Taboola are two paid channels offering pay-per-click promotion on high-authority media sites. These ads appear under the ‘related articles’ content you’ve found online – often with thumbnails and click-enticing titles. Sometimes, you can find the company’s footprint above the section of related content. While these ads are usually cheaper than Facebook ads, the quality of your traffic can prove to be doubtful. While experimenting, content strategist Jacob McMillen drove about 90 clicks for $30 – $35. However, he couldn’t tell if the traffic was high-quality or converting as the content source was dubious. Depending on your goals, Quuu Promote may or may not be right for you. Remember that the promotional side of it is entirely different compared to the automated content to your social channels. And if you like to experiment, you can also take a jab at the nRelate and LinkWithin platforms. Rigorous content promotion is crucial for content marketing success in this day and age. The given are some of the best strategies used by the majority of the big-name content marketers out there. So go out there and start experimenting what works best for you. Also, did you see exponential content promotion success with any specific method? Let me know in the comments below and I will get back to you right away.